But it's paving the way for the rest of us. When you drive the $134,000 Tesla Model S P100D, you want to tell the world that it goes from 0 to 60 in 2.5 seconds. You're like a child excited about a new toy, stopping strangers on the streets to regale them with your tales of wonder. But to many, that staggeringly quick acceleration has little to no meaning. They have no personal barometer to judge it against. They really have to experience it. They have to sit in the car and feel their internal organs and eyes warp as the car leaps forward. And when they do, there's nervous laughter, swearing and sometimes pleas to never do it again. Seriously, if you're rich and own one of these, give all your friends a ride. The fact is, you don't have to push your passengers into their seats time and time again to realize how wonderful the P100D actually is. That thrill of going extremely fast in a very short period of time (while exciting) is only a small portion of the P100D's charm. In a dense urban environment like San Francisco there aren't a lot of opportunities to live out your Top Gear dreams. Instead, I spent most of the week with the car commuting, meeting with family (holidays!) and heading to Costco. 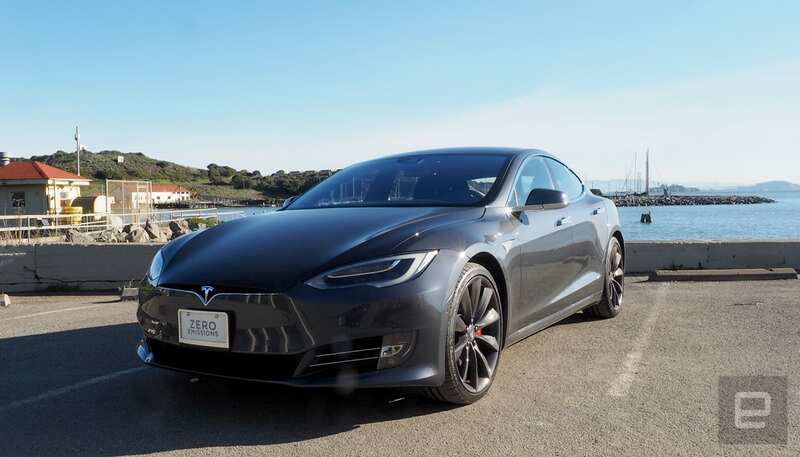 The Model S is a glorious luxury car with the amenities you'd expect to find in fine German sedans, and it has enough room to cram your brood and their presents into the cabin and trunk. It's also on the cutting edge of semiautonomous and EV tech that's working its way into less-expensive vehicles. Whether on surface streets, hitting the freeway or navigating the hellscape that is a box-store parking lot, the car performed admirably. On the highway is where you'll find the true Tesla experience thanks to Autopilot. We've talked before about how it lowers the stress of commuting and can help reduce the chances of a collision. It still does all that, but an update that reins in one of the core features is a welcome addition. Now Autopilot limits drivers to the posted speed limit on undivided roadways. So, if you're on a small four-lane highway without a median, you can't make Autopilot grow a lead foot. 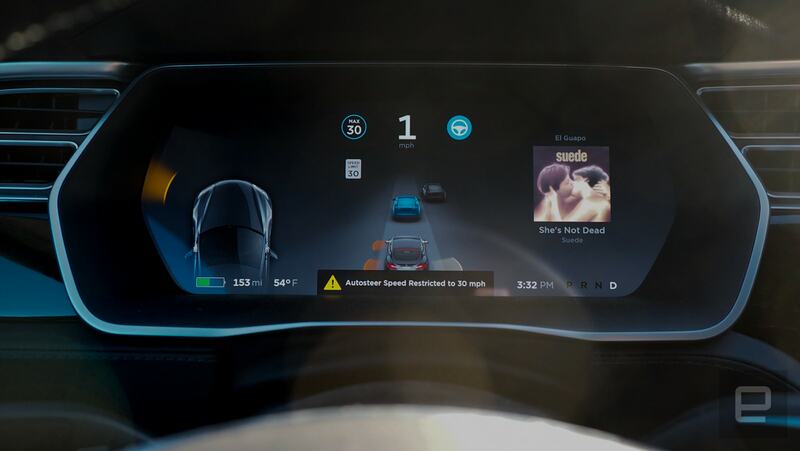 It's a small thing that'll probably produce some grumblings on Tesla message boards, but it's good to see the automaker thinking more and more about safety while pushing the boundaries of auto tech. 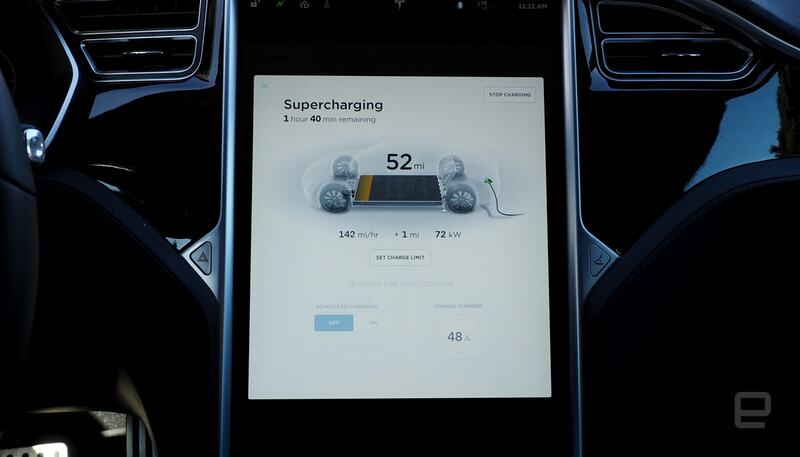 Other than the updated Autopilot, the rest of the technology in the Model S is pretty much what we found in the Model X. The enormous 17-inch touchscreen that controls everything from the car's ride height (from very low for that sport look to high enough to get over the tallest speed bumps) to music is still, for the most part, easy to use. Although, I would prefer that climate controls be physical buttons. A few times I reached over to peck at something on the display and missed. Fortunately, some of the features like music and voice commands can be controlled from the buttons and turn knobs on the steering wheel. 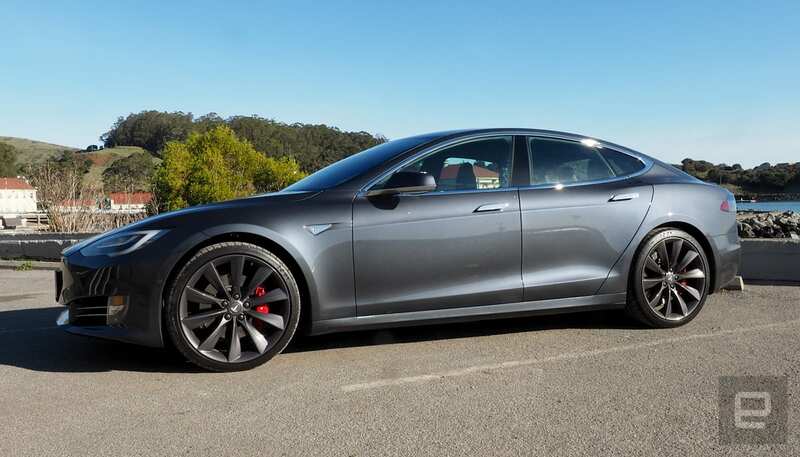 Tesla is known for innovation and speed, but people overlook the Model S's luxury. The vehicle sits five, no problem, as long as the rear passengers are shorter than 6 feet tall. The leather seats were cozy and the wood and suede trim in the cabin add a dash of class without being ostentatious. 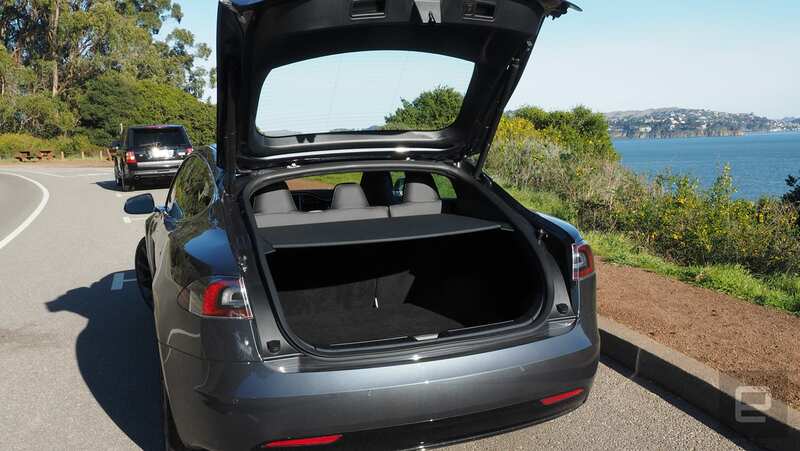 If you need to do more than drive folks around, the trunk is huge. During a Costco run, I was able to fit a microwave, space heater, random food and enough toilet paper to survive the zombie apocalypse in it with no problem. That's without using the hidden space below the trunk floor. With seating and cargo space aplenty, the interior feels almost cavernous. That probably has something to do with the lack of an internal combustion engine, but really, it's the size of the car itself. It's a huge sedan. Pulling into compact parking spaces meant riding the edge of the painted lines and hoping no one parked next to me. Fortunately, thanks to its low center of gravity and stiff chassis, it doesn't feel like you're driving a boat. The steering and handling are crisp and trick you into thinking you're driving a smaller car. In fact, the Model S P100D is three cars. It's a technological marvel capable of driving 315 miles between a charge (I got about 305 miles) and will take care of the heavy driving in stop and go traffic. It's a supercar that will silently launch you down the road so quickly you'll find yourself doing 90 in the blink of an eye. And it's a luxury sedan that smoothes out the road, makes you feel comfortable and cements the idea that you've made all the right decisions in life. Oh, and it's good for a Costco run. Cramming three spectacular cars into one isn't cheap. Starting at $134,000, the P100D is out of reach for most of us. It's definitely out of my reach. But Tesla says this car will help fund the building of the Model 3. Of course, the 373,000 presales, at $1,000 a pop, for the low-cost Tesla are also probably helping get the $35,000 automobile on the road. Fortunately, that third car, filled with technology, is coming for the rest of us. It will be either the Model 3, Chevy Bolt or some other vehicle that changes the way we get from Point A to Point B. The P100D is an outstanding car. But more importantly, it's part of a process to get us all into long-range EVs with autonomous features. It's like Usain Bolt reminding us to go out and run. Sure, we'll never be as fast as the Olympian, but he's getting us to treat our bodies better.